The Hurricane SunDeck 2486 is a 24-footer with sleek looks, excellent performance and all the room you’d expect on a deck boat. The bow lounge is the classic playpen style with comfortable wrap-around bench seating. If you want to access the bow platform there’s a clever foldaway centre seat that allows walkthrough access without having to step on the cushions. Of course, there is storage underneath the seats. The open, molded compartments make it easy to get gear in and out or to clean. Just behind the starboard side bench you’ll find a useful covered compartment and bucket to use either as a small trash bin or, better still, an ice bucket. That will work nicely with the multiple cup holders and speakers here as well. As far as drink storage, there’s room for a cooler in the storage compartment in front of the helm and behind the front bench seat – truly a fun and functional entertaining area. Moving back, there is a good-sized head compartment on the portside to make long days out on the water a little more civilized. It features a porthole vent, sink and head. There’s an additional exterior sink in the cockpit just beside it as well. 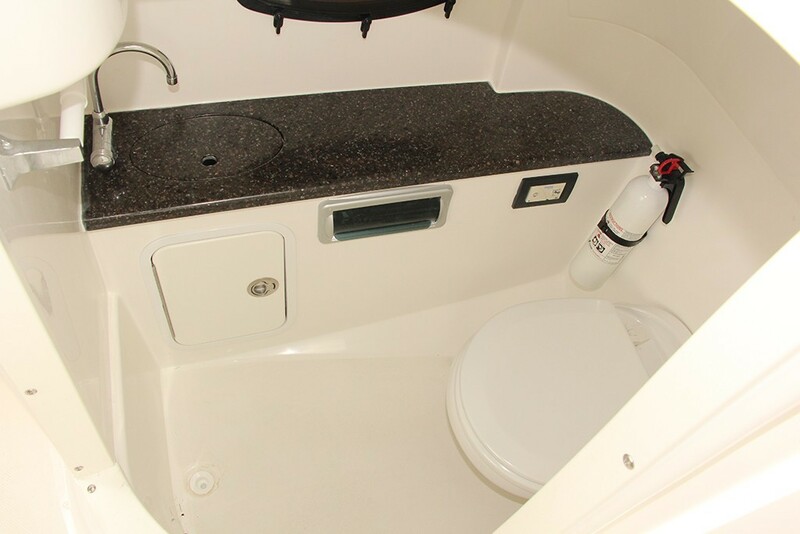 All the space is well utilized and a roomy compartment on the portside is perfect for wallets and phones. 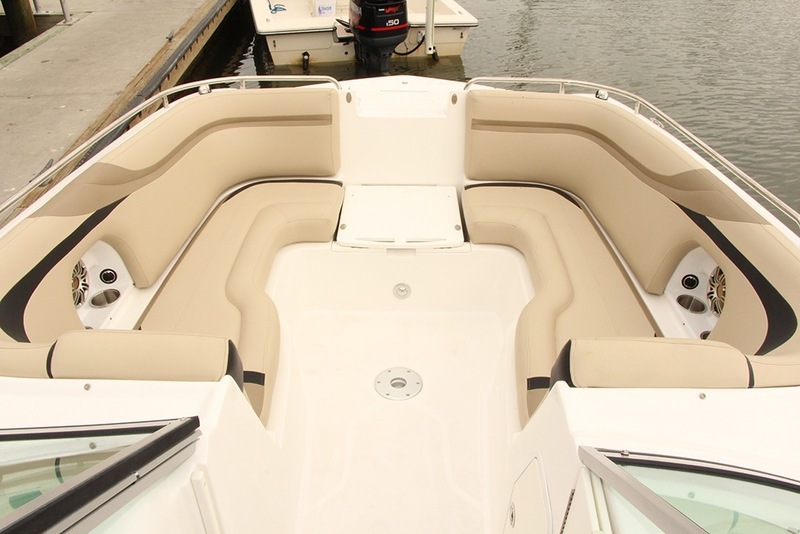 The dual, bolstered bucket seats midship are a comfy fit for passenger or captain at the helm. In between the seats is a large in-floor locker, which easily fits a large safety bag with lifejackets. The stern has more wrap-around seating with the same clever walk-through hideaway centre seat. 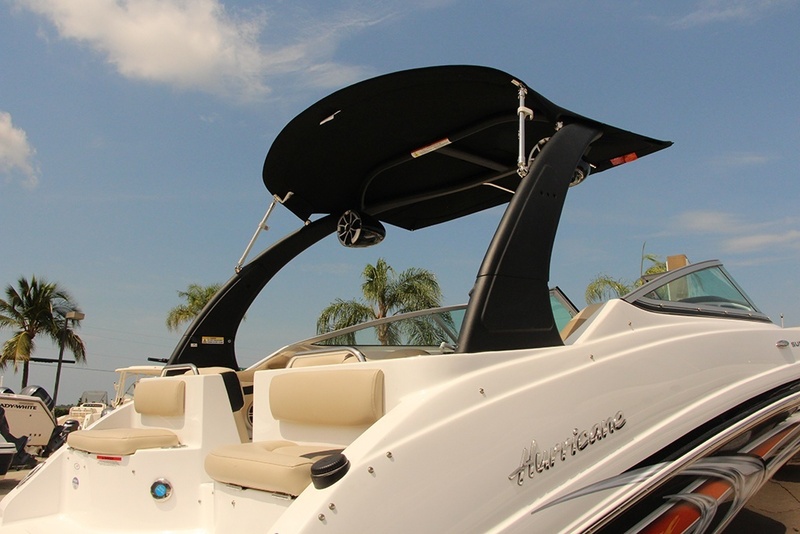 Covering this area and providing shade for most of the cockpit is the bimini top which, on the Xtreme package, also means a wakeboard tower along with two big bumping speakers and upgraded hull graphics. 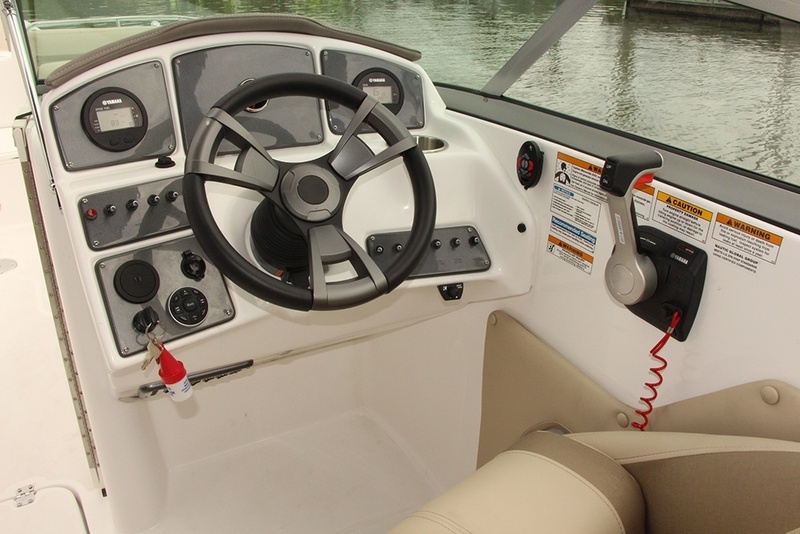 Outboard power saves space in the transom but often at the expense of the swim platform. Not here. It actually surrounds the motor offering a full-beam wrap-around style platform with small, but comfy, seats on each side and more storage underneath. This SunDeck 2486 has Yamaha’s 250-horsepower four-stroke outboard and it packs plenty of punch to power this 14 person party pad. I was able to take for a spin a more standard model with a 250-hp Yamaha and the Xtreme package with the bigger motor on it. While the 250-hp is plenty of power for family cruising, the 300-hp Yamaha, which maxes out the rating for this boat, is epic. It will really rock you like a Hurricane! Jumping from zero-to-20 miles per hour in five-and-a-half seconds and to 30 in fewer than nine seconds with a two-person test load. Keep in mind this 24-foot, beamy deck boat weighs more than 5000 pounds. The well-designed hull and solid performance from the outboard equal guaranteed smiles on board –and almost a hat in the water, though I was able to grab it as it flew off my head! It cruises nicely around 31 miles per hour at 3500 rpm but if you go full throttle and tweak the trim you can easily crack 50. We topped out at 51.9 mph. Now, handling has always been a bit of a tradeoff for deck boats. By maximizing space, weight is added and so too is a wider hull, making turns a little looser than a traditional runabout. The 2486 is no different with a bit of sliding in the corners, but with some practice the power of the Yamaha can help you navigate tight turns. Just don’t expect this to bite as well as traditional deep-V hulled smaller runabouts. It’s fast and it’s big, but it’s also a dry ride. Don’t get me wrong, I love being in the water and splashing around on PWCs, but on boats I don’t want to get wet unless I choose to and this Hurricane obliges. In the test waters just off Naples, Florida big boats cruised by and winds whipped up the water, but the only time I got wet was when I stuck the camera over the side of the boat. 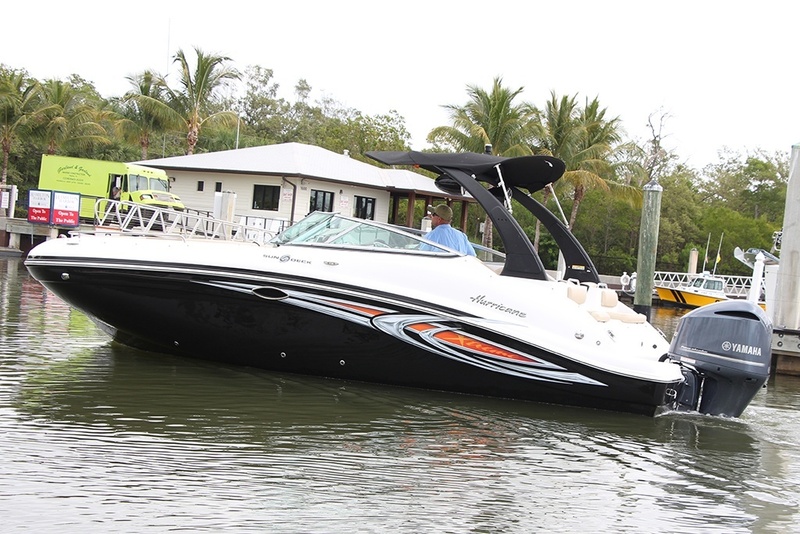 The SunDeck 2486 is a 51-mile per hour fun machine and a thrilling ride. It makes a great day boat even in big water. You may just find the most enjoyable time will be when your Hurricane makes landfall. Extend the deep, three-step swim ladder from the bow and claim a small piece of paradise for your family, even if just for an afternoon.